While writing my guide to hexagonal grids I ran into some html+css+js issues that I need to spend more time learning about. Here are a few things that are on my mind. A few weeks before Game Developers Conference, I thought to myself, what article can I write that’ll just take 2 weeks? 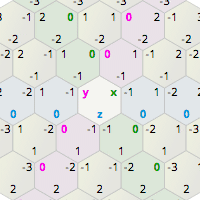 I decided hexagonal grids, as a subset of my bigger article on all grids, would be a reasonable choice. I already have all the material; I've collected it for nearly 20 years on my site.